How Does QuickBooks Online Handle Mobile Expenses? If you purchase several items and services away from the office, QuickBooks Online can help you record them while you’re out and about. Add and edit estimates, invoices, and sales receipts. Add and edit customers, vendors, products, and services. One of the most common uses of the app, though, is the recording of expenses. Rather than coming home from a trip with your briefcase stuffed full of receipts and notes about purchases you made, you can document them on the road using your mobile device. When you get back to the office and log on to QuickBooks Online, they’ll all be there. 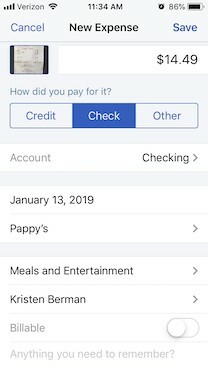 You can snap a photo of a receipt with your smartphone and attach it to an expense you record in QuickBooks Online’s mobile app. Open your QuickBooks Online mobile app and click the plus (+) sign at the bottom, then tap the Expense icon. The New Expense screen will open. If you have a paper receipt, lay it flat on a table in a well-lighted area. Click the camera icon and then the Take Photo link. If you took the picture outside of QuickBooks Online for some reason, you’d select the Choose Existing link. Your device’s camera will open, and you’ll see four squared corners on the edges of the screen. Hover your device over the receipt. You’ll need to position the camera so the receipt area that you want captured appears within the four corners. QuickBooks Online will provide advice along the way to help you do this. When you’re in the right place, you’ll see the phrase, Great! Snap the pic. Click the shutter icon below, and your device will snap the photo and display it. If you want to use it, click Use this photo (if you want to try again, click the X in the upper left of the screen). QuickBooks Online will open the New Expense screen. You’ll see a miniature version of your receipt in the upper left corner. Looking at your original version—it will be too small to see here—fill in the blanks with the data from the purchase. Be sure to click the Billable button if you can bill someone else for it. Make any notes you’ll need in order to remind yourself of the transaction, and Add a Split if you need to divide the transaction between categories, customers or vendors, or billable status. Click Save when you’re done. Once you’ve entered an expense in QuickBooks Online’s mobile app, it will be synchronized with your desktop, browser-based version. Of course, no duplicate data entry is required once you’ve entered a receipt in the QuickBooks Online mobile app – the two versions always update each other. Once you’re back at your desktop, on the browser-based version of QuickBooks Online, click Expenses in the toolbar to open the Expense Transactions screen. You should see the transaction you just created on your mobile device first in line on the list that displays. Click View/Edit at the end of that line to see it. Look toward the bottom under Item Details to see the link to an attachment that contains the photo you snapped of the receipt. The record of the expense you entered on your mobile device will contain a link to an attachment that contains the photo of your receipt. Of course, you don’t have to take a picture of your receipt with your mobile device. You can simply enter the details of your expense and Save the record. QuickBooks Online’s mobile app can help you save time and improve the accuracy of your work done away from the office. As we mentioned earlier, the app is capable of doing much more than simply recording receipts. We would be happy to explain and review the app with you to make sure your remote accounting work is done correctly. Please contact us with any questions or to make an appointment. https://tarlow.com/wp-content/uploads/2016/05/logo.png 0 0 Joanna Castle https://tarlow.com/wp-content/uploads/2016/05/logo.png Joanna Castle2019-02-12 20:27:142019-02-19 18:44:53How Does QuickBooks Online Handle Mobile Expenses? Tax-Deferred Exchange – Many people refer to this arrangement as a “tax-free exchange,” but the gain is not actually tax-free; rather, it is deferred into another property. The gain will eventually be taxed when that property is sold (or will be deferred again in another exchange). These arrangements are also known as “1031 exchanges,” in reference to the tax code section that authorizes them: IRC Sec. 1031. In the past, these exchanges applied to all properties, but since 2017, they have only applied to business- or investment-related exchanges of real estate. One of the requirements is that the exchanges must involve like-kind properties. However, the tax regulations for real estate exchanges are very liberal, and virtually any property can be exchanged for any other, regardless of whether they are improved or unimproved. One exception to this rule is that U.S. property cannot be exchanged for foreign property. Exchange treatment is not optional; if an exchange meets the requirements of Sec. 1031, the gain must be deferred. Thus, taxpayers who do not wish to defer gains should avoid using an exchange. It is almost impossible to for an exchange to be simultaneous, so the tax code permits delayed exchanges. Although such exchanges have other requirements, they generally involve a replacement property (or properties) that is identified within 45 days and acquired within 180 days or the tax-return due date (including extensions) for the year when the original property was transferred—whichever is sooner. An exchange accommodator typically holds the proceeds from such exchanges until they can be completed. The tax code also permits reverse exchanges, in which an exchange accommodator holds the replacement property’s title until the exchange can be completed. The other exchange property must be identified within 45 days, and the transaction must be completed within 180 days of the sale of the original property. The amount of gain that is deferred using the exchange method depends on the properties’ fair-market values and mortgage amounts, as well as on whether an unlike property (boot) is involved in the exchange. The rule of thumb is that the exchange is more likely to be fully tax deferred when the properties have greater value and equity. Installment Sale – In an installment sale, the property’s seller provides a loan to the buyer. The seller then only pays income taxes only on the portion of the taxable gains that occur during the year of the sale; this includes the down payment and any other principal payments received in that year. The seller then collects interest on the loan at rates approaching those that banks charge. Each year, the seller pays tax on the interest and the taxable portion of the principal payments received in that year. For a sale to qualify as an installment sale, the seller must receive at least one payment after the year when the sale occurs. Installment sales are most frequently used for real estate; they cannot be used for the sale of publicly traded stock or securities. The installment sale provisions also do not apply when the sale results in a tax loss. If the sold property is mortgaged, the mortgage must be paid off as part of the sale. Even if the seller does not have the financial resources to pay off the existing loan, an installment sale may be possible if the seller takes a secondary lending position or includes the existing mortgage in the new loan. An installment sale has hazards; for instance, the buyer may decide to either pay off the installment loan or sell the property early. If either occurs, the installment plan ends, and the balance of the gains are taxable in the year when the buyer either paid off the loan or sold the property (unless the new buyer assumes the loan). Qualified Opportunity Funds – Individuals who have capital gains from the sale of a personal, investment, or business asset can temporarily defer those gains into a qualified opportunity fund (QOF). In the Tax Cuts and Jobs Act, Congress created QOFs to help communities that still have not recovered from the previous decade’s economic downturn. QOFs are intended to promote investments in certain economically distressed communities, or “qualified opportunity zones.” To qualify as a QOF, a fund must hold at least 90% of its assets in qualified-opportunity-zone property. For a gain to be deferrable, it must be invested in a QOF within 180 days of the sale that resulted in the gain. The gain is deferred until December 31, 2026—or to the year when the taxpayer withdraws the QOF assets, if that occurs earlier. As the investment is an untaxed gain, the taxpayer’s initial basis in the QOF is zero; this basis lasts for five years, so any funds withdrawn from the QOF in that time are fully taxable. If the funds are left in the QOF for at least five years, the basis increases to 10% of the deferred gain; in other words, 10% of the original gain is tax-free. If the funds are left in the QOF for at least seven years, the basis increases again, to 15% of the deferred gain; thus 15% of the original gain is tax-free. If the funds remain in the QOF after the tax on the gain has been paid, then the basis is equal to the amount of the original deferred gain. If the funds are left in the QOF for at least 10 years, the taxpayer can elect to increase the basis to the property’s fair market value. With this adjustment, the appreciation of the QOF investment is not taxable. If a taxpayer’s investment in a QOF consists of both deferred gains and other funds, it is treated as two investments. The special tax treatment described above only applies to the deferred gains; the other funds are treated as an ordinary investment. Unlike tax-deferred exchanges, QOFs only require the investment of the gains (not the entire proceeds of the sale). Each of the aforementioned tax strategies is complicated and only applies in certain situations. None of these strategies should be utilized without careful analysis to ensure their suitability. Please note that not all of the qualifications for these strategies are included in this article. If you have questions about these strategies or would like to make an appointment to analyze whether these tax-deferral options fit your situation, please call us. The season to prepare tax returns has begun. Unfortunately, it is also the season for scammers who are out to steal your identity, swindle you out of your money, and even file tax returns in your name. All of this can make you poorer, ruin your credit rating, cause financial havoc, and cost you hours of time trying to straighten out the messes caused by cybercrooks. Communication from the IRS. If you receive a phone call, fax, or letter from an individual claiming to be from the IRS, you should immediately contact us before providing any information. You should do this whether you suspect the contact is legitimate or not. You can also contact the IRS at 1-800-829-1040 to determine if the IRS has a legitimate need to contact you. Unfortunately, our modern communication methods have provided opportunities for cybercrooks to scam you, which is a growing problem. You have to be vigilant and always keep your guard up. Don’t take their bait. Always contact us if you receive any communications from the IRS or state tax authorities. Be extra cautious with emails, phone calls, and mail. If you have questions related to phishing or ID theft, please call us. To ensure that you get through tax season without unnecessary costs and aggravation, below is a list of the tax penalties that the IRS most frequently assesses against taxpayers. Let’s take a deep dive into each penalty. The more you know, the better you’ll understand how to avoid these mistakes. As important as it is to know about the penalty so that you don’t take money out hastily and without a full understanding of the impact of doing so, but it’s also important to know when you can take the money out without being penalized. You’re permitted to take out up to $10,000 from an IRA for the purchase of a first home, as well as to pay any uncovered, unreimbursed medical bills that add up to more than ten percent of your adjusted gross income from any retirement plan. If you’ve been out of work and received unemployment compensation for a minimum of 12 weeks, you can take out up to $10,000 from and IRA to pay for your health insurance premiums. Distributions can also be taken from an IRA to pay for qualified higher education expenses, including fees, room and board and of course tuition, all without penalty. And if you’re leaving your job during the same year that you’re turning 55 or older, you can take money out of a 401(k) account from the job that you’re leaving without penalty. The fact that there is no penalty does not negate the income taxes that you would be required to pay on withdrawals from any retirement account. Though the list of penalties provided here is not exhaustive, it gives you a good idea of where you can get into trouble, as well as how to avoid it. Learn the requirements, follow them, and when in doubt, contact us with any questions and to request assistance. It’s also important to know that if you get yourself into trouble, you’re much better off facing your situation then trying to pretend it doesn’t exist. Our professionals can guide you through the process, help you find answers, and implement solutions. With the advent of online sites such as Airbnb, VRBO, and HomeAway, many individuals have taken to renting out their first or second home through these online rental sites, which match property owners with prospective renters. If you are doing that or are planning to do so, there are some special tax rules you need to know. These special (and sometimes complex) taxation rules are based upon the length of time you rent your property out and with varying tax outcomes. In some situations, the rental income may be tax-free. In other situations, your rental income and expenses may need to be treated as a business, as opposed to a rental activity. The following is a general synopsis of the rules governing short-term rentals (those rented for average rental periods of 30 days or less). Rented for Fewer Than 15 Days during the Year – When a property is rented for fewer than 15 days during the tax year, the rental income is not reportable, and the expenses associated with that rental are not deductible. Interest and property taxes are not prorated, and the full amounts of the qualified mortgage interest and property taxes are reported as itemized deductions (as usual) on the taxpayer’s Schedule A. A. The average customer use of the property is for 7 days or fewer—or for 30 days or fewer, if the owner (or someone on the owner’s behalf) provides significant personal services. B. The owner (or someone on the owner’s behalf) provides extraordinary personal services without regard to the property’s average period of customer use. If the activity is not treated as a rental, then it will be treated as a trade or business, and the income and expenses, including prorated interest and taxes, will be reported on Schedule C instead of Schedule E, the IRS form used to report longer-term real estate rentals. IRS Publication 527 states: “If you provide substantial services that are primarily for your tenant’s convenience, such as regular cleaning, changing linen, or maid service, you report your rental income and expenses on Schedule C.” Substantial services do not include furnishing heat and light, cleaning public areas, collecting trash, and such. Exception to the 30-Day Rule – If the personal services provided are similar to those that generally are provided in connection with long-term rentals of high-grade commercial or residential real property (such as public area cleaning and trash collection), and if the rental also includes maid and linen services that cost less than 10% of the rental fee, then the personal services are neither significant nor extraordinary for the purposes of the 30-day rule. Profits and Losses on Schedule C – Profit from a rental activity is not subject to self-employment tax, but a profitable rental activity that is reported as a business on Schedule C is subject to this tax. A loss from this type of activity is still treated as a passive activity loss unless the taxpayer meets the material participation test – generally, providing 500 or more hours of personal services during the year or qualifying as a real estate professional. Losses from passive activities are deductible only up to the passive income amount, but unused losses can be carried forward to future years. A special allowance for real-estate rental activities with active participation permits a loss against nonpassive income of up to $25,000 – but phases out when one’s modified adjusted gross income is between $100K and $150K. However, this allowance does NOT apply when the activity is reported on Schedule C.
These rules can be complicated; please call us to determine how they apply to your particular circumstances and what actions you can take to minimize the tax liability and maximize the tax benefits from your rental activities. Welcome to 2019 and a delayed provision of the tax reform, also known as the Tax Cuts and Jobs Act (TCJA). For divorce agreements entered into after December 31, 2018, or pre-existing agreements that are modified after that date to expressly provide that alimony received is not included in the recipient’s income, alimony will no longer be deductible by the payer and won’t be income to the recipient. This is in stark contrast to the treatment of alimony payments under decrees entered into and finalized before the end of 2018, for which alimony will continue to be deductible by the payer and income to the recipient. (1) Must be in cash, paid to the spouse, the ex-spouse, or a third party on behalf of a spouse or ex-spouse, and the payments must be made after the divorce decree. If made under a separation agreement, the payment must be made after execution of that agreement. (2) Must be required by a decree or instrument incident to divorce, a written separation agreement, or a support decree that does not designate payments as non-deductible by the payer or excludable by the payee. Voluntary payments to an ex-spouse do not count as alimony payments. (3) Cannot be designated as child support. Child support is not alimony. (4) Are valid alimony only if the taxpayers live apart after the decree. Spouses who share the same household can’t qualify for alimony deductions. This is true even if the spouses live separately within a dwelling unit. (5) Must end on the death of the payee (recipient) spouse. If the divorce decree is silent, courts will generally consider state law, and where state law is vague, judges may make their own decision based on the facts and circumstances of the case. (6) Cannot be contingent on the status of a child. That is, any amount that is discontinued when a child reaches 18, moves away, etc., is not alimony. Post-2018 Decrees– For decrees entered into after 2018 (and pre-2019 decrees that are modified and include the TCJA alimony rules): Alimony is not deductible by the payer-spouse/ex-spouse. If you have questions related to alimony or about how your state will tax alimony beginning in 2019, please give us a call. As they do at the beginning of every year, employers will request that employees complete the IRS Form W-4. Its purpose is to provide employers with the information they need to determine the amount of federal income taxes to withhold from an employee’s paycheck. So, it is very important that the form is completed correctly. The problem is that as simple as the form looks, getting those entries on the form to produce the desired withholding amount can be tricky. The passage of the tax reform added additional complications, and the IRS has delayed a major revision of the W-4 until the 2020 tax year. In the meantime, taxpayers must get along as best they can using the old version of the W-4. Perhaps you desire to have a substantial refund when your taxes are completed next year. This generally requires custom W-4 adjustments, to produce excessive withholding. Keep in mind: when you have a large refund, you have provided Uncle Sam with an interest-free loan. Your spouse may also work, and your combined incomes may put you in a higher tax bracket. Although the IRS provides a special worksheet for married taxpayers if both spouses work, it may not always provide the desired results. In addition to payroll income, you may also have self-employment income, which is subject to both income tax and self-employment, and so you may require a combination of payroll withholding and estimated tax payments, adding additional complications to the W-4. These are just the tip of the iceberg, as there may be investment income or losses, business losses, tax credits, special deductions and loss carryovers, just to name a few more situations that could impact your tax prepayments and withholding for the year. If you are concerned about getting your withholding correct, please contact us. We can project your 2019 tax liability and complete your W-4 after taking into account multiple employments, a working spouse, self-employment income and other tax issues unique to your specific tax situation. Every business is different, and though we encourage all business owners to give serious consideration to obtaining an Employer Identification Number, we know that it may not apply to your situation. Please call us if have questions related to an Employer Identification Number and your particular circumstances. Taxpayers are required to pre-pay their taxes for any tax year through payroll withholding, estimated tax payments or a combination of the two. Employees and retirees generally accomplish this through withholding, and self-employed individuals and those with investment income by paying quarterly estimated payments. The late-2017 passage of tax reform that became effective for 2018 and its radical changes added considerable confusion for taxpayers trying to determine how much they should prepay for 2018. This confusion was made worse because the existing W-4 that employees complete and that their employers use to determine the correct withholding was designed for prior law and does not work well with the new tax law. As a result, there has been ongoing concern by the IRS that many taxpayers will end up owing tax this year when they file their 2018 returns, even though they got a tax reduction due to the tax reform changes, simply because their pre-payments through withholding and estimated tax payments were not enough. For most of 2018, the IRS was issuing alerts that taxpayers may be under-withheld because of tax reform and the fact the W-4 could no longer be relied upon to produce a correct withholding amount. 100% of the prior year’s tax liability (110% where the prior year AGI is over $150,000 ($75,000 if married and filing separate returns). Recently several members of Congress have called upon the IRS to waive underpayment penalties for 2018. On January 16, 2019, although not waiving the penalties entirely, the IRS did change the current year safe harbor from 90% of the 2018 tax liability to 85%, providing a break for some taxpayers. Retired (after reaching age 62) or became disabled in 2017 or 2018. If the total tax shown on your 2018 return minus the tax that was withheld is less than $1,000, you will not owe a penalty. If you had no tax liability in 2017, were a U.S. citizen or resident alien for all of 2017, and your 2017 return was for a full 12 months (or would have been had you been required to file), you won’t be charged an under-prepayment penalty. In addition, where your tax liability and /or tax pre-payments were uneven, the penalty amount may be mitigated by figuring it on a quarterly basis. If you have questions or would like to make sure your withholding and estimated payments are adequate for 2019, please give us a call. Ever since tax reform was passed over a year ago, taxpayers have been uncertain whether rental property will be classified as a trade or business for purposes of qualifying for the new IRC Sec 199A 20% pass-through deduction (commonly referred to as the 199A deduction). Finally, on January 18, 2019, the IRS issued a notice which provided “safe harbor” conditions under which a rental real estate activity will be treated as a trade or business for purposes of the 199A deduction. It’s important to note that this notice prescribes several conditions that must be met for a rental real estate enterprise (a tax term introduced by the IRS in this notice) to be deemed to be a trade or business and eligible for the section 199A 20% deduction. For purposes of this safe harbor, a rental real estate enterprise is defined as an interest in real property held for the production of rents and may consist of an interest in multiple properties. a. A real estate enterprise can consist of a single or multiple real estate rentals. b. Commercial and residential rentals cannot be combined in the same real estate enterprise. For years prior to 2023, at least 250 hours of rental services must be performed by the taxpayer and workers for the taxpayer for the year in question with reference to each rental real estate enterprise. d. who performed the services.Because the safe harbor requirements were issued after the close of 2018, the requirement for contemporaneous records for 2018 will not apply. Rental services that may be counted toward the 250 hour requirement include: (i) advertising to rent or lease the real estate; (ii) negotiating and executing leases; (iii) verifying information contained in tenant applications; (iv) collecting rent; (v) daily operation, maintenance, and repair of the property; (vi) management of the real estate; (vii) purchase of materials for operation such as repairs; and (viii) supervision of employees and independent contractors. However, rental services do NOT include financial or investment management activities, such as arranging financing; procuring property; studying and reviewing financial statements or reports on operations, planning, managing, or constructing long-term capital improvements; or hours spent traveling to and from the real estate. Rental services counted toward the 250 requirement may be performed by owners or employees, agents, and/or independent contractors working for the owners. Triple net Leases are not eligible for safe harbor. Real estate rented or leased under a triple net lease agreement is not eligible for this safe harbor. A triple net lease includes a lease agreement that requires the tenant or lessee to pay taxes, fees, and insurance, and to be responsible for maintenance activities for a property in addition to rent and utilities. Also ineligible for the safe harbor is a property leased under an agreement that requires the tenant or lessee to pay a portion of the taxes, fees, and insurance, and to be responsible for maintenance activities allocable to the portion of the property rented by the tenant. Vacation rentals are not eligible for safe harbor. Real estate used as a residence by the taxpayer for any portion of the taxable year is not eligible for the safe harbor rules. Double-edged sword. The 199A deduction is 20% of a taxpayer’s qualified business income from all of the taxpayer’s trades or businesses subject to certain limitations. Many rentals do not show a profit and a rental that is treated as a trade or business that shows a loss for the year will reduce the qualified business income of other trades or businesses of an individual, and as a result, reduces the 199A deduction of that individual. If you have questions regarding rentals as a trade or business or other issues related to this new 199A deduction, please call us to schedule a consultation.